Baby Led Weaning | Is Baby Led Weaning the Best Way to Introduce Solid Foods? Baby Led Weaning – Starting solids with foods straight from the dinner table! More and more parents are turning to “Baby Led” approach to weaning and introducing solid foods to baby. Many parents choose to offer their babies food that is puréed while others prefer to jump straight into “table foods”. Introducing solids to your baby using “table foods” rather than purees is what Baby led Weaning is all about. What is a good age for Baby Led Weaning? Babies should be at least 6 months of age if you wish to use the BLW method of introducing solid foods. They should be able to sit up unassisted, have lost the tongue thrust reflex and should be able to grasp and hold onto foods. Good starter foods for BLW are those found in the charts for the 4-6 month range and the 6-8 month range. So what exactly is Baby Led Weaning as relates to solid food introduction? In short, Baby Led Weaning (BLW) is skipping thin and runny purées and not feeding your baby with a spoon. As with breastfeeding on demand, Baby Led Weaning is a method of introducing solid foods that leaves it up to your baby to decide what, when and how much to eat. While not necessarily a “hands off” approach, Baby Led Weaning does advocate allowing your baby to make all food choices for him or herself. Visit the new Baby Led Weaning Recipes and Food Ideas page! With Baby Led Weaning, Do I just give my baby the food and then walk-away? Many who have researched BLW have the misunderstanding that the “hands off” approach means that there should never be any intervention by the parent. This is a common misconception and one we feel is in need of clarifying. I have had many parents ask “how can I just give my baby food and then not help her eat it or feed her the food?”. While Baby Led Weaning does encourage the infant to lead the way, parents must realize that they need to help guide and direct their babies through the weaning process. It might be easier to think of Baby Led Weaning as introducing foods that are not pureed and paying close attention to your baby’s cues rather than trying to establish set feeding schedules and set portion sizes. Watch your baby as she experiments with the food and if need be, show her how to guide the food to her mouth but do not feed her. You will not be spoon-feeding your baby, rather your baby will be feeding (or smooshing and squishing and tossing) herself. When it is time for introducing solid foods and weaning a baby onto solid foods, you must feel comfortable in the methods and the foods that will make up the introduction to solid foods. As noted in the How Much Should My Baby Eat? page, “following your baby’s cues during feeding time will ensure that your baby is eating the proper amounts of food for him or her.” You see, the majority of healthy babies will eat just the right amount of foods that they need. Many who advocate Baby Led Weaning believe that babies who feed themselves early on are better able to control just what their bodies need to nourish them. Will my baby get enough of the right nutrients if we do baby led weaning? Offering your baby a well balanced diet of solid foods will help ensure that your baby is eating the right amount of the right foods. It is important to pay close attention to your baby’s cues as your baby’s feeding patterns will change daily and may be affected by the goings-on around him. You do not want to accidentally override your baby’s ability to self-regulate his or her feeding by continuing to try and feed your baby. The Baby Led Weaning approach is much the same as we noted above. Is it dangerous to skip purées and begin with table foods? The answer to the above question is both yes and no. If you are delaying solid foods until after the age of 6 months old, then your baby may readily accept textures and “table foods”. On the other hand, if you are beginning solid foods between the age of 4 and 6 months old, it is highly unlikely that baby would be able to handle “table foods”. You should ensure that these foods are offered in a manner so as not to pose a choking hazard. Please keep in mind that all babies are different and will eat textures, bits and chunks of foods at their own pace. For more information about solid food and weaning, read our Ready for Solids page. 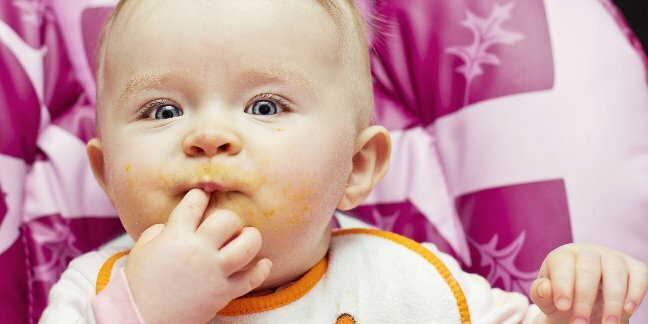 Is Baby Led Weaning right for your baby? How Feasible is the BLW Approach? We have received a few emails asking why our website has recipes for purees and why we are promoting baby food in purée format; many of the emailers say that purees are dangerous for babies. Baby Led Weaning is a great option for introducing solid foods to your baby however, many advocates say that if you don’t practice Baby Led Weaning, then a baby is just not learning to eat real foods. Real foods are prepared in your kitchen from fresh ingredients whether they are pureed or not, they do not come out of jars. Homemade baby food in puree form is real food as is “homemade baby food” in chunks, pieces, mashed bits, etc. Of most interest [and concern] is the assertion that if you feed your baby purees, then your baby will become ill, will not learn to chew and will become obese and constipated. After many days and hours of scouring through various medical resources such as the AAP, WHO and UNICEF, no studies or firm professional conclusions could be found that purees are dangerous for babies nor could information be found to confirm that feeding babies purees will lead to various and sundry complications.